The lawyer from Rhinebeck won with a plurality of the Democratic primary vote, making him the first Hispanic major party nominee for Congress in the region. Delgado declares victory at his election watch party at Rough Draft Bar and Books in Kingston. A grueling year-long contest for the Democratic nomination in NY19 finally came to a conclusion Tuesday. 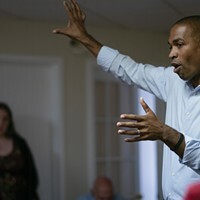 Antonio Delgado, a Rhinebeck resident who climbed his way up from a working class upbringing in Schenectady to attain a Rhodes Scholarship, attend Harvard Law School, and work as an attorney at an influential law firm, will be the Democratic nominee in New York’s 19th Congressional District. 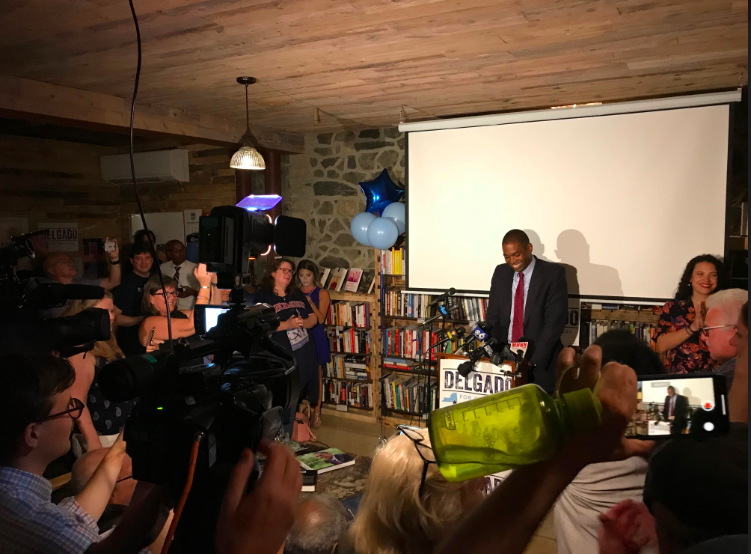 That’s according to The New York Times, who, with 99% of precincts reporting, projected that Delgado had locked up the nomination with 22 percent of the vote, or 7,690 votes total. He swept Gareth Rhdes, a former aide for Governor Andrew Cuomo from Kerhonkson who garnered 17.9 percent; Pat Ryan, a veteran and tech businessman from Gardiner who got 17.7 percent; Jeff Beals, a diplomat and teacher from Woodstock who got 13.2 percent; Brian Flynn, a business executive from Elka Park who got 13.2 percent; Dave Clegg, a lawyer and minister from Kingston who got 11.1 percent; and Erin Collier, an agricultural economist from Cooperstown who got just 4.9 percent of the vote. He will now proceed to the general election where he will face Republican incumbent John Faso of Kinderhook; Green Party nominee Steven Greenfield, a musician and school board member from New Paltz; Libertarian Party nominee Victoria Alexander, a novelist from Dutchess County; and Working Families nominee Bob Cohen, a policy director for Citizen Action New York. That’s in addition to two independent candidates, each of whom will need to acquire 3,500 petition signatures in order to appear on the ballot: Diane Neal, an actress of “Law and Order SVU” fame from Kingston, and Luisa Parker, a social worker from Monticello, both progressives. Delgado will be the first Hispanic major party nominee running to represent the region encompassed by NY19. He is also the first biracial major party nominee. The first Black nominee was Larry Otis Graham in 2000, and the first person of color nominated was Yash Aggarwal in 1996, both Democrats. While not considered a shoe-in, Delgado was seen as the mild favorite coming into election day. 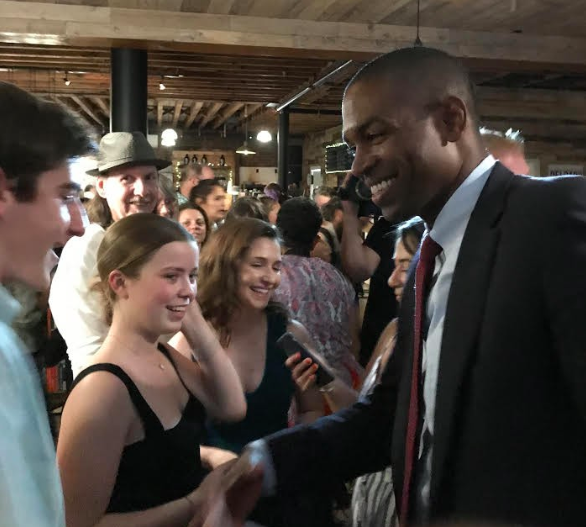 Polls of the race, even those taken by campaigns opposing Delgado, consistently showed him leading, albeit by slim margins. Delgado also came in with a sizeable fundraising haul, having raised over $2.3 million. That’s more than any other candidate, including Faso. Delgado shakes hands with his interns. Delgado describes himself and his upbringing as typical of the NY19 story. “The way I grew up in Schenectady; working class family, parents working for GE, my family was very much a part of that narrative,” he says. In one interview, he vividly describes his upbringing as “growing up in small apartments and cutting coupons and putting clothes and appliances on layaway.” As with many Hudson Valley families working the economically sound jobs provided by GE and IBM, the Delgados had a “secure predictable income, and overtime worked our way up from working class to middle class.” He credits his parents, both college graduates, “drilling into me the importance of a good education,” as the facilitators of his academic discipline, which resulted in his meteoric rise. Delgado enrolled at Colgate University, a prestigious liberal arts college just north of NY19. He initially intended to be a pre-med student but eventually changed course and studied politics and philosophy instead. He also played basketball at Colgate, attending the NCAA Division 1 championships in 1996, and was inducted into the upstate New York basketball hall of fame earlier this month. He was teammates with Adonal Foyle who went on to play for the Golden State Warriors and Orlando Magic. But Delgado was bound for a different path. After Colgate, he studied politics, philosophy and economics (PPE) at Oxford University via a prestigious Rhodes Scholarship. He then went on to get his JD at Harvard Law School. It was there he met his wife Lacey, a half-black, half-Jewish documentary filmmaker from Kingston whose film “Little White Lie” explores the complicated racial nature of her parentage. “I was a part of a generation that benefited from the last economic order, as was my wife,” Delgado believes, but “since we’ve gone on to do pretty well for ourselves, the world has changed considerably. Working families like the one that I come from, have been left behind.” Delgado believes that the American dream, which would have once “provided opportunities for our children” is vanishing. After law school, Delgado moved to Los Angeles, where he tried his hand at something much different from philosophy, politics or law: rap music. Delgado founded Statik Entertainment and took up the persona of AD The Voice, hoping to “broaden people's minds about the genre and the scope of hip hop by infusing elements of orchestral and classical music.” He never used his law school training much in this profession, as he explained in one interview, “I was a partner, but fundamentally my focus was on the art.” But due to a lack of success and a clash with the culture of the industry, Delgado chose to move on from his career as a rapper, transitioning into litigation at the office of Brian D. Witzer in LA for a year. In 2011, he moved to New Jersey and took a job with Akin Gump, a high powered law firm in New York City at which he worked as an attorney for seven years. Then he got Trumped. Trump’s election was for Delgado, as it was for many people, a watershed moment. 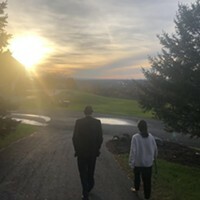 “When Trump won, he certainly made my wife and I sit down and think about our own individual lives,” Delgado said, “and what the next phase of our life ought to look like in light of a dramatic alteration of reality – one that was difficult to process.” In February, 2017, Delgado and his wife bought a house in Rhinebeck. ”For a number of years, we had talked about wanting to come back to the area and raise our [sons] by their grandparents and get back to upstate living,” he explained. He says he and his wife chose Rhinebeck because of its proximity to her parents and its high-quality public schools. Delgado says despite having lived in LA and Montclair New Jersey and working in New York City, he’s an upstate man through and through. “I’ve always enjoyed upstate life. I enjoy quiet peace and the beauty of the area,” he claims, adding that he also enjoys the residents of upstate New York because they’re “real, honest, upfront, and they care.” But some have still expressed concerns that he is vulnerable to the toxic carpetbagger label which notably helped sink his predecessors Sean Eldridge and Zephyr Teachout in their runs for the seat. But Delgado draws stark contrast between himself and them. Delgado takes photos with ecstatic supporters. “The man has somehow earned the nickname no-show,” Delgado said of Faso, “and to me, that is a very unfortunate outcome. One should, as a representative, want no part of that type of description. 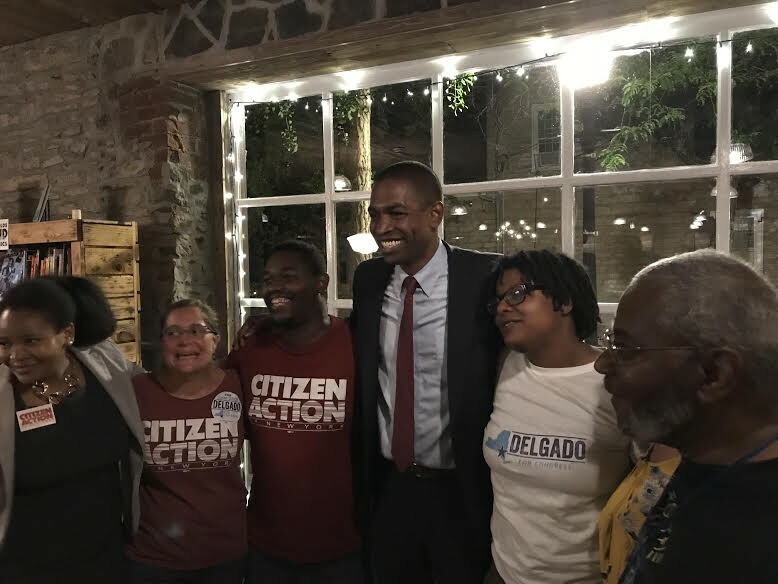 Your job is to show up, your job is to fight for the people of your district.” Delgado explains that, to appeal to swing voters and those disaffected by Faso, including the roughly 20% of voters who approve of Trump but disapprove of Faso, “the efforts are really no different than the effort to mobilize folks who didn’t vote for Trump.” This includes “being transparent and accessible, representing [voters’] interests, and being accountable and beholden to only the [voters].” He argues that this can win the votes of many of those reform-minded Trump voters, something that Faso is unable to do because he “was never here for them in the first place. He was manufactured by outside interests and put in this seat to accomplish goals that do not reflect the will of the people here.” To Delgado, this includes voting for the American Health Care Act and a bill to defund Planned Parenthood.